This game could have been called “PGA Tour Golf II: European Edition.” Created using the PGA Tour Golf II engine, PGA European Tour is not so much a sequel but rather a modification of the previous installment. 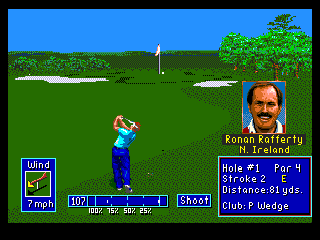 The interface and control are indistinguishable from PGA II; it’s only the content that differs. Instead of PGA Tour pros, the game features 60 European players, and comes with 5 courses, all new to the PGA Tour series. The Wentworth Club, located near London, was the site of the Volvo PGA Championship (now the BMW PGA Championship.) The Forest of Arden Country Club was the site of the British Open at the time this game was released and more recently has hosted the British Masters. Crans-sur-Sierre is a Swiss golf club located high in the Swiss Alps. Le Golf National, near Paris, is the perennial site of the Open de France. Valderrama Golf Club, located in southern Spain, is considered to be one of the best courses in all of Europe. PGA European Tour also features 2 new gameplay modes. In “match play” mode, each player earns 1 point for each hole they win (by having the lowest number of strokes). Under this system, no player can fall behind by more than 1 point for each hole they lose. In “shoot-out” mode, 4 golfers begin playing and at the end of each hole the worst golfer is eliminated. As do the the new courses, these new modes add additional replay value to an already great game. This game is nothing more than PGA Tour Golf II with a whole bunch of new stuff to do, and there’s nothing wrong with that. Buy PGA European Tour on GameGavel or Amazon. Tagged genesis, Golf, PGA European Tour, Review, sega, Sports. Bookmark the permalink.